Before we begin today, thank you so much for your overwhelming outpouring of support after last week's post. Through the blog, social media, YouTube and private message, hundreds of you wrote in to offer condolences and share your memories of Gatsby and of your own dear pets and I can't tell you how that has helped me in the grieving process. Thank you. Thank you. Every day it gets easier but as you know, losing a dear pet is a very hard thing to go through. It will take time to heal. 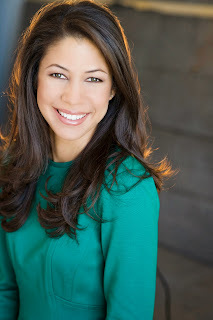 This week's post shares an anecdote from this summer on looking presentable always. Why do I write about this topic and why do I continue to explore it? I believe that looking presentable is more than just a superficial thing. It's not just about style. It's not just about beauty. It's not about impressing other people. It is about so much more than that. It is about dignity. It is about respect: both respect for self and respect for others. I am sure you have noticed how casual and sloppy our society is becoming. It is rapidly changing every single day. This is something that bothers me deeply. Does it bother you? All we can do is work on ourselves and strive to present ourselves beautifully each day, to the best of our ability. This small action, believe it or not, can help to turn the problem around. 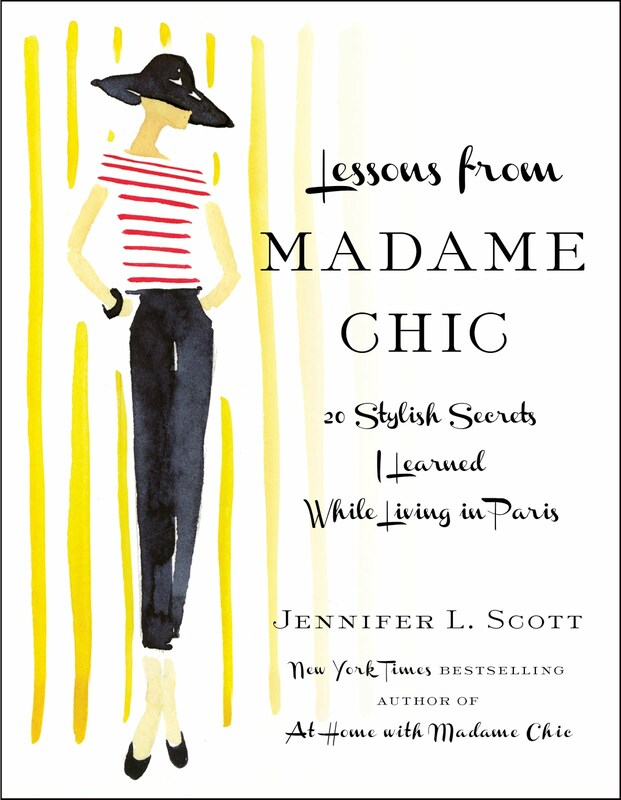 Polish Your Poise with Madame Chic: Lessons in Everyday Elegance comes out October 27th from Simon & Schuster. Pre-order available now. Rather than a thought, this week I have a task for you. This week be an observer. Observe other people, whether strange or familiar. Take note of how they present themselves through dress. Observe the way you present yourself. Analyze how these observations make you feel. Just store this information for now. We will do more with it later. Kelsey, I loved your comment and I am so happy that you and your baby are both benefitting from this. Well done! This week I would love to hear from you. What do you observe from how people present themselves today? Do you strive to look presentable always? Why is this important? Let me know and you could be picked as the comment of the week! Gatsby passed away this past week. He was so dear to me and I know that he was dear to many of you who got to know him on the blog and in the videos. I know all dog lovers think this way about their pet, but Gatsby was special! He was funny, mean, grumpy, distinguished, protective, loyal and so lovable. Last November he suffered a bad bout of pancreatitis, but through hospitalization and medication we were able to get him back on track. He seemed OK for the months that followed but recently we saw another decline in his health and this time it was terminal. Anyone who has ever lost a pet knows how agonizing it can be. I was with him until his last moments and the last thing I told him before he died was that I loved him. Now I am just getting used to life without him. You never realize how your pet plays such a big part in your life! I am reminded of him what feels like hundreds of times throughout the day. I put together a little video this week with pictures of him as a way to remember him. Thank you for all of your loving comments to Gatsby over the years. I'm sure he could feel the love. If any of you are grieving the loss of a pet I am sending you love too. Please let me know about your special pet and why they meant so much to you. I would love to hear that. I hope that you are having a wonderful summer (winter for our southern hemisphere friends). I am now officially back from my break and am jumping right back in with a highly requested one week of outfits video. Next week I'll let you know all that happened on my break and preview what we have to look forward to this fall. This week's video shows you a slice of life from a very lazy summer's week! I hope you enjoy seeing how the ten-item wardrobe actively works in my life. All of these pieces will be familiar to you. For links and more information on the clothes you see in this video, please refer to my original ten-item wardrobe post for spring/summer 2015. The Talbot's wedges featured in the video are sadly no longer available on their website. I'm hoping they will bring them back next spring as they are comfortable and very stylish. Don't worry about looking perfect every day. It's OK if your hair isn't pinterest worthy or your clothes aren't meticulously pressed. The aim is to do your best, to not let yourself go and to inject some passion into your style! 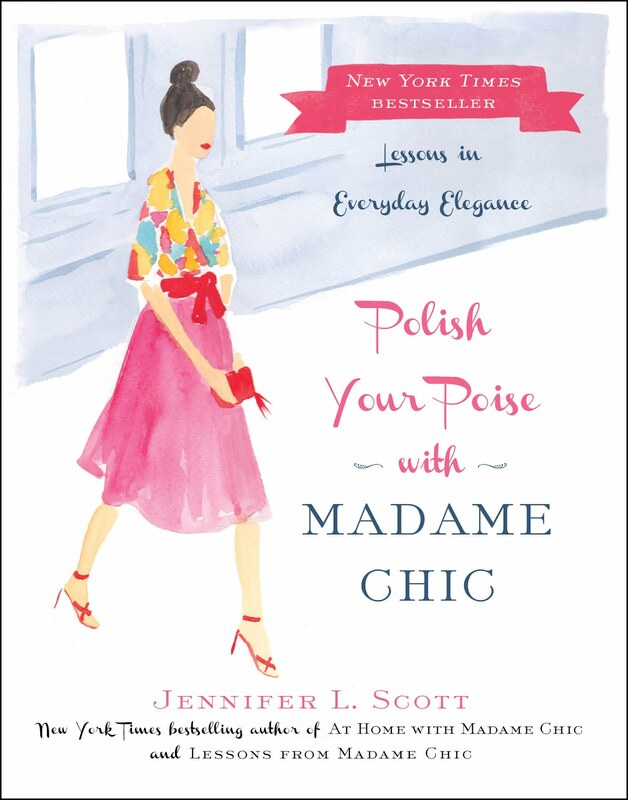 Polish Your Poise with Madame Chic comes out on October 27th from Simon & Schuster. You can pre-order your copy today! I am featured on Little Yellow Couch's Style Matters podcast. Check out my fun discussion on all things style with Zandra and Karen. In Pursuit of the Finer Things is counting down the days until Polish Your Poise with Madame Chic debuts! I don't think I've ever commented here before...but I had to pop in to tell you how much you have inspired me. As a Texas girl, born and bred, and a transplant to North Carolina I have always lived in hot and humid climates. As such, I lived in shorts and tee shirts on the weekends during the extended summers that we have. But, the older I've gotten, the more frumpier I would feel. So this summer, thanks to you, I've begun wearing dresses/skirts on the weekends - instead of just for the work week. And it has totally changed the way I feel about myself on the weekends. Even the husband and son have noticed and are constantly complimenting me on my outfits. Thank you! Keep it up. Eventually the word will spread to the masses and we will all start dressing better. Thank you Gigi! I am so happy you are enjoying this process! I need advice on the ten item wardrobe for fall. I work in NYC in the corporate office for a well known luxury company and prefer to wear separates at the office. Mostly trousers and skirts and just an occasional dress. Should I aim for ten bottoms and ten tops or should I streamline even further? I like the uniform idea for me of trousers, shell and jacket however since my office is usually overheated in winter I need to wear tailored shirts or lightweight sweaters. Professional yet comfortable. Like most New Yorkers I wear a lot of black. Your thoughts? Thank you for your question Helen. I would adhere to the ten-item wardrobe and choose fewer trousers. Ten trousers can be excessive and you might find that you can get away with having between three to five pairs plus as many blouses or tops that you need to get through the week. Remember you do not have to strictly adhere to the number ten, but it's a great idea to streamline and not go overboard either. You might find that as time goes on you can get by with much less (and actually prefer it!). Don't worry about wearing the same thing twice in one week as you can style it to look differently. Best of luck and have fun curating your wardrobe! 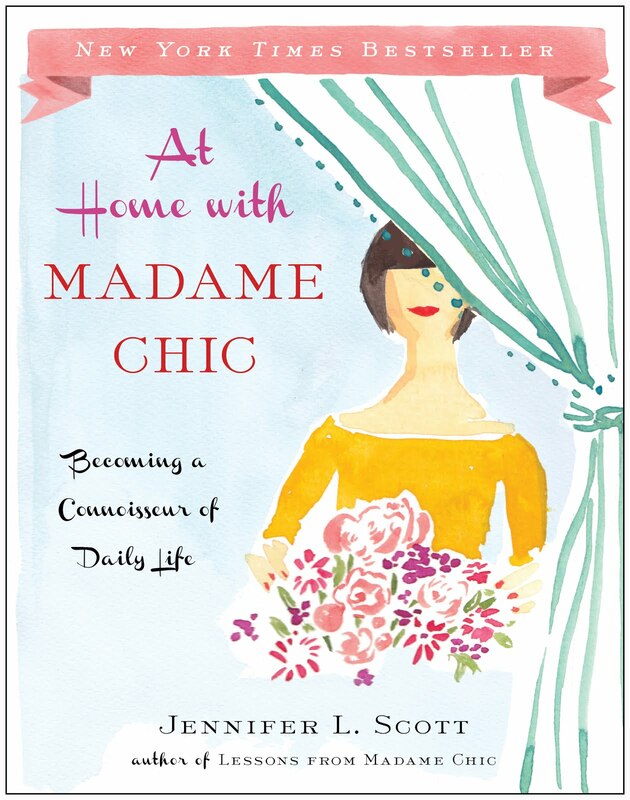 You may or may not remember I enjoyed your music recommendations in At Home With Madame Chic. I have found a composer/pianist who works much like Ludovico Einaudi, his name is Giovanni Allevi, I think you would like him. Thank you Rose! I will check out his music. See you next week as I share a look presentable always anecdote with you among other musings.